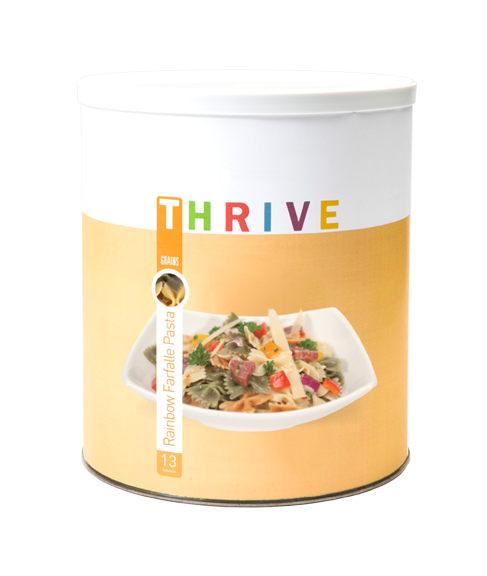 Thrive Rainbow Farfalle Pasta brings fun shapes and colors to any pasta dish. Naturally colored by tomato and spinach, this enriched pasta is perfect for baked dishes, cold salads, and your favorite pasta recipes. SEMOLINA, (ENRICHED WITH IRON [FERROUS SULFATE] AND B VITAMINS [NIACIN, THIAMIN MONONITRATE, RIBOFLAVIN, FOLIC ACID] ), TOMATO SOLIDS, DRIED SPINACH. CONTAINS: WHEAT. PROCESSED IN A FACILITY THAT HANDLES MILK, EGG, SOY, WHEAT, AND TREE NUT PRODUCTS.